Ready for the next motorcycle meeting? Everyone will love this gingerbread present! The motorcycle is covered in frosty detail. We can attache your logo printed on sugar paper to the gingerbread, in addition, you can still customize the font and the color scheme. 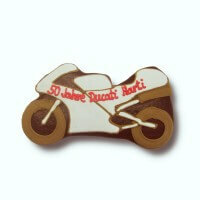 This is how your dream motorcycle is made as a gingerbread! Each gingerbread motorcycle is unique and is made by hand, therefore, shape, color and arrangement may vary slightly.